I don’t care if spring has chilled down to the level of a Greenland glacier, it’s still sunny. And so, in the great British tradition, I am determined to forge ahead as though I’m in a temperate paradise. So it’s got to be fresh light food to match those – ahem – fresh winds blowing down from the north. It’s culled and adapted from the Ottolenghi cookbook – my favourite for fresh and interesting flavour combos. Yottam Ottolenghi must have made some diabolical bargain at a dixie crossroads. It’s the only explanation of his supernaturally light touch with food. He combines ingredients and flavours in such a simple, innovative and delicious way. This salad is a case in point. The fresh beany crunch is perfectly complemented by the light, almost buttery flavour of roasted hazelnuts. Chives add just a touch of pungency and the orange zest brings the whole dish to life. Even better, this is a dish that just keeps on giving. It was thrown together as an accompaniment to roast chicken, but it made for an equally lovely lunch the next day. Served with something grainy or some fresh bread or cheese, it could become the focus for a light lunch. 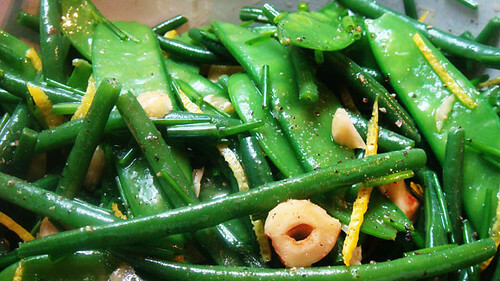 You can really play with this salad, the beans make for a perfect base from which to improvise. You could add pomegranate seeds, goats cheese and/or pinenuts. Or you could replace the mange tout with chickpeas or white beans, and chop the green beans into segments to make it a little bulkier. Heat the oven to about 150 oC. Fill as big a pan as possible with water for the beans and mange tout. The more space you give them, the more they retain their vivid green colouring. I use a big old casserole pot. Bring the water to the boil. While it’s heating up, trim and wash the beans and mange tout, keeping them separate. When the water is bubbling merrily away drop the beans in and cook for 4 minutes. Take them out, plonk them in a colander and run under plenty of cold water to stop them cooking further. Bring the water back to the boil and drop the mange tout in and cook them for no more than a minute. Then drain them into a colander and run under cold water. Dry the beans and the mange tout with some paper towels and put in a large salad bowl. Put the hazelnuts into the oven and roast for about 7 minutes. Remove and squeeze the skins off – they should mostly crumble away. It doesn’t matter if some bits are left on. Roughly chop with a big, very sharp knife, You don’t want them too finely chopped, there should be plenty of halves, even the odd whole hazelnut left. Wash the orange and peel away the zest in strips, trying to minimise the amount of white pith you take with it. Slice the strips as finely as possible. Slice the chives in to 1cm lengths. Add the hazelnuts, orange zest and chives, grind over some black pepper to the beans and toss until all mixed up. Add the sesame (or walnut, hazelnut, pecan or any other nut oil you might have) and olive oils and toss some more. Darn, that sounds mighty fine! Definitely going to give it a try. Thanks for flagging it up. crazy, wonderful combo! i adore it. crunch crunch. @shayma – thanks! It kept that crunch for a couple of days worth of fridging too. Perfect weekday fodder. This looks fabulous! I just discovered your blog and wish I had a year ago when I was on my way to London. This dish is mow on my to-do-soon list. @Louise – thanks! I bet you can get all if these bits and pieces in Toronto (did i get that right?) as well as London. I’m making this at the weekend for my folks…and probably the roast pepper and mozz thingy from the book.